– A simplified face format to minimise the use of the handicap system. – Trophies awarded for each category winner. – Aim to increase participation. strongest riders), Group 3 (next strongest riders). This is similar to the previous format except that Group 4 has been merged with Group 3. Anyone who wishes to challenge their grading can discuss it with a member of the race committee, and the committee as a whole will decide to uphold or deny the challenge. We have done our best to be fair to all riders in the grading that was applied. There will be no mid-season upgrading of riders (exception, see note below). Grading will continue at the start of each year where previous year’s performance will be taken into account. Anyone wishing to race who is not graded at Group 3 level or higher will be included in Group 3 on the night but given a time handicap in order to help them to race as competitively as possible. Each category of rider will race within their own group on the night, so there will be three races over the same course. Riders can only race within their own group or ride with a higher group on the night. Any rider racing outside of their grade will not earn points. This is to stop stronger riders from influencing the outcome of a lower group’s race. Group 3 starts, then 2 minutes later Group 2 starts, then 2 minutes later Group 1 starts. This should give ample opportunity for the groups to race together for a while, and whoever feels strong can jump on to a stronger group (stick it out or blow up, that’s the risk). By having a short gap between starts, groups get a chance to warm up the legs before the stronger groups join them, and Group 1 are not waiting for extended periods for any handicap time to expire. Note: Any rider who is seen to be able to stay with a stronger group on a regular basis will face the race committee’s review to see if that rider should be permanently upgraded. The rider with the most points will win the series, and so on for the next two places. The best three results in each series of four will be counted, so a rider can miss one race and still be in contention. In the event of a draw, the riders placings in all four races will be taken into consideration, and if they cannot be separated at this point they will share the series. The results of both series (6 of 8 best results) will be amalgamated to decide the overall winner of each group for the year. There will be prizes for overall 1 st , 2 nd , 3 rd per category at the year end. (*) Prizes will be allocated at the end of the year based on monies collected from race fees. The aim is to build up the distances as the year progresses. Existing race routes will be used where possible. Race 4 of the Spring Series will double as the Lookout Trophy. Race 2 of the Summer Series will double as the Club Championship Road Race. Race 3 of the Summer Series will double as the Club Championship Hill Climb. NOTE: The above three races are also Club Championship races, so for the purposes of determining the club champion a time handicap will be applied between the groups. This won’t have any bearing on the internal group competitions however. The Time Trial Series incorporates some new changes for 2019. A competitor starts their year racing against their fastest time of the previous year and that remains until they beat it or reach the end of the season, then next season their time to beat will be set as their best actual time from the previous season. For those with no previous times recorded, they will race against a predetermined time for their assigned category. There will be 4 time trials in the JJ Moynan TT series. The best three results will be counted towards deciding the winner of the series. There will be points awarded for each time trial as detailed below. Also, for each CATEGORY, 10 points will be awarded to the competitor who improves on their previous best time the ost, 9 points for the second best improvement, 8 points for the third best improvement etc., down to 1 point for the 10 th best improvement. There will be a stand alone Club Championship Time Trial. The result of this TT will not be counted towards the JJ Moynan Series competition but can be used to replace a lesser result from the Series when counted towards the Cyclists of the Year competitions. The club league table is intended to promote and encourage competition throughout the club and between the differing rider abilities. The league table will be updated with the results from weekly races illustrating where each rider will stand overall in the club race league and within each category. Your competition is the rider directly above you in the league table in your category. The club league table is based on the points allocated from each race as described above. There will be a Cyclist of the Year competition for each Group (1/2/3). The Cyclist of the Year competition will include the points from each rider’s three highest scoring JJ Moynan TT races and the points from each riders six highest scoring RR. It will also include points from Club Championship races. To qualify for the cyclist of the year competition, a rider must have entered at least one J. Moynan TT race, one Road Race and one Championship Race. The rider with the most points accumulated thereafter will be awarded ‘Cyclist of the Year’. The Corrigan Cup will be presented to the Cyclist of The Year from Group 1. Two new trophies will be presented to the winners of Groups 2 and 3. – All races will be held on Thursday evenings. 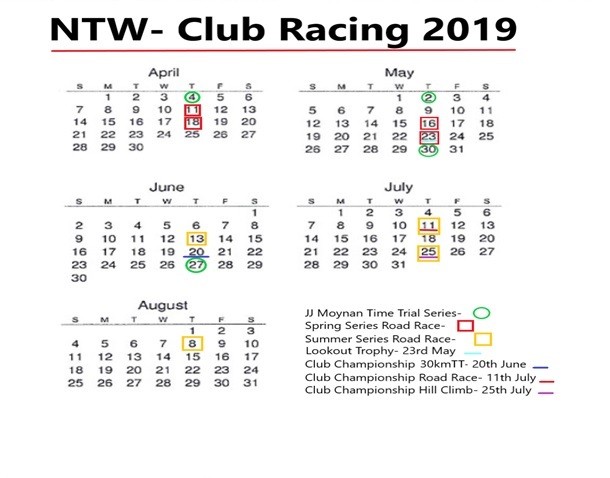 See the Racing Calendar for 2019 below for the schedule. – All distances and routes will be made available in the week prior to each race. – All cyclists wishing to race are required to have a Limited Competition Licence. participate once they pay the race fee. – Overall race program (road races and TT’s) will total 13 races, down from 18 in 2018.
races/series/titles, and we hope it will be seen as a more equal and fairer format. – There will be a family rate of €10 per race. – Setting off in the incorrect category group will result in the forfeit of race points on the night. – In the event of a crash the race result will stand. Drafting during a Time Trial will result in disqualification from the race. A 10 meter gap needs to be kept. If overtaking another participant then stay outside their line until well past them before pulling back in. If being overtaken then do not pull out behind the person overtaking you to try and get a draft from them.Also, we are not the only cyclists using the roads and as well as the above for time trials, if a group is being overtaken by another faster moving group of cyclists they must not start drafting them. You either overtake them or drop away from them to allow at least a 10 meter gap form. Any cyclist or groups taking part in our races seen to be gaining an advantage by drafting people or vehicles outside of the race will also be disqualified. Any dispute on the allocation of race points can be made prior to the running of the next race. Please contact the committee with any queries regarding the race calendar and proposed points structure on northtippwheelers@gmail.com. The race committee’s decision is final.